Anyone have experiences with it or any reasons why this wouldn't work? for mine i just went the simple option... an ebay RNSE female 3.5mm aux connector and an amazon bluetooth module with 3.5mm jack. works perfectly for my needs. I’ve tried a few and none came close to this one, I’ve also added the DAB module that works flawlessly, just in case they ever turn off the analogue signal. Bit more hassle to fit as it comes pre-wired into a quad lock harness that will never fit behind the RNSE so you’ll have to wire it into the existing harness. Hey Ashy, thanks for your reply... I did look into this option, its cheap for sure but no real integration that I'm looking for. Would be nice to have the track info on the display and change tracks via the headunit button. plus I'm looking for handsfree to using the headunits telephone, etc. Hey Warren, I don't mind spending the money if it works. I want full integration as much as possible at least! I managed to scoop up my RNS-E dirt cheap so paying a little more to get it to work as I want it is all good. Just want to make sure I get the right stuff. On a slightly different but kind of relevant note, I've tried to change my start up screen to the S3 logo...... but when I change the value to (1) in channel 18 in navigation adaptions, it literally doesn't do anything... keeps changing back to (0)?! my RNS-E is 650 so above 500. VCDS won't give me the option to save the value for some reason. Any ideas mate? Thats a very good point! I'm assuming then no has been able to to this? Yeah unfortunately you can only code the startup screen to match the vehicle you have the RNSE coded for so having the startup screen for an S3 when you've got it coded for an A6 is impossible. I've done a lot of searching and not found anyone that's been able to get round this. Dang oh well, small detail I guess..... Just annoying when its there in front of you and you cant do something so simple. https://rover.ebay.com/rover/0/0/0?mpre=https://www.ebay.co.uk/ulk/itm/283129284804 So this is the one Warren suggested to get full integration, etc.... but it states “must have multifunctional steering wheel” why MUST it have a multifunctional-steering wheel in order to work, surely it can without? Thanks TJ, no one is available until Monday now. if I don't hear anything via email ill drop them a call. It does say on there website that you can use "either" the multifunctional steering wheels buttons, or the headunit buttons. but weather you have to have the steering wheel installed in order for the whole thing to work, I'll just have to wait and see what they say I guess. 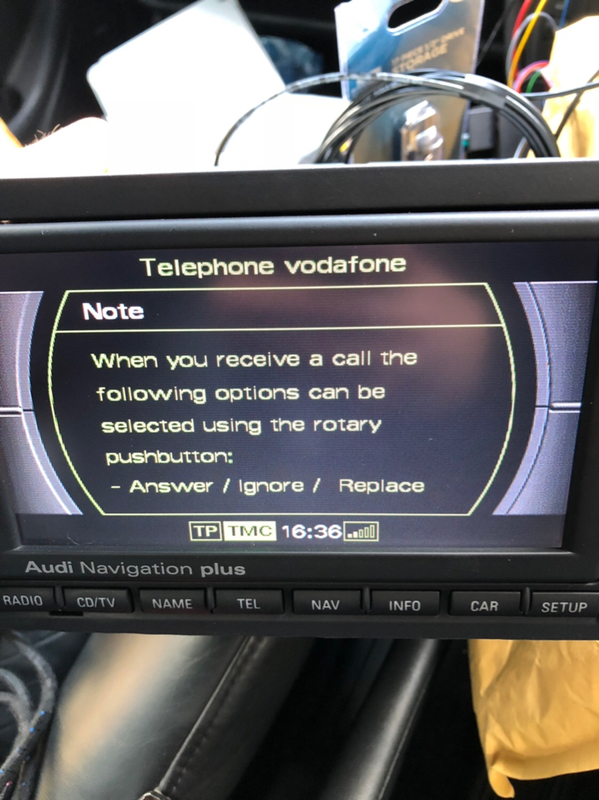 Right guys I’ve bought a genuine Audi Bluetooth module (8P0 862 335 H) complete with microphone, Bluetooth antenna and wiring harness for the RNS-E. Soon as I’ve got a weekend I can work on my car I’ll fit and code it in with VCDS. Reasoning behind this is because it’s really the only way you can get full integration with your phone and the RNS-E display and buttons plus the DIS. As for streaming music.... I’m going to go down the same route as @Ashy>> posted above, I’ve bought a RNS-E AV to 3.5mm AUX cable and I’ll code this in so AUX will be selectable via the headunit. Then I’ll buy a decent Bluetooth receiver and connect it to the 3.5mm output and an additional 12v feed. One that preferably auto-connects with your phone every time you get in the car and doesn’t stay on when the cars off draining the battery. This will all be hidden out of sight. Good thing about the new iPhone’s is you can connect to several Bluetooth devices..... so my theory is as soon as I get into the car and pair with both the Audi Bluetooth module and the 3.5mm Bluetooth receiver it’ll all work in harmony and I’ll use my phone for selecting music, which is no bad thing... radio stations, amazon music, Spotify, etc, etc. Thanks mate for confirming that, I hadn’t heard anything back from dension. This is why I’m going to go the route I’m going now. Genuine Audi Bluetooth phone module and Aux/Bluetooth for music streaming. I may consider an alternative down the line when I install a MFSW. so my theory is as soon as I get into the car and pair with both the Audi Bluetooth module and the 3.5mm Bluetooth receiver it’ll all work in harmony and I’ll use my phone for selecting music, which is no bad thing... radio stations, amazon music, Spotify, etc, etc. Trust me, you will soon get fed up of having to control everything through your phone. If your MFSW is a way off yet I have a Dension BT Lite for sale that will at least allow you to change tracks through the head unit. Thanks mate, just had a quick look and see you’ve got it for sale on eBay... the wiring is for the symphony 1 headunit. So ISO connectors rather than the small 12 pin block for the RNS-E quadlock. I’ll give it a miss on this occasion. My phone will usually be vent mounted by the steering wheel, so changing tracks, accepting calls, etc. Will be closer to me than the headunit. Until I get a MFSW I’ll stick to this method thanks for the offer though. Oh they are hot on it these days! Slightly different topic but relative to the RNS-E what’s the max size SD cards we can put in it and does that display track names? I read somewhere the RNS-E MK1 can only take 4GB cards? Yeah limited to 4GB on the Mk1. I believe it does display track names but never actually used it. Cheers thanks for your help Warren! But, I can’t see how to dial or go through my phonebook via the RNSE. When someone calls it comes up and I can accept or decline the call. But finding someone to call doesn’t seem to be an option. All I’m getting is this message on the screen. Can anyone advise? Getting more functionality with the RNSE. So can call numbers, etc. However still can’t seem to get my phonebook up? This has now given me full integration with my phone and the RNSE for phone calls, phonebook, etc. In order to change the code you need to enter the Direct entry 77 via VCDS. ...and on my other card.. I think I’ll probably get a couple 4GB SD cards and whack some tracks on there for instant music. Can’t believe how sensitive the RNSE is with card types though! Apparently it has to be a non-HC SD Card. Which is harder to source and seem to be a lot more money now? !